Quote; "On the eve of the final Commons debate on the trade union Bill at report stage and third reading today (November 10), opposition to the legislation has reached critical mass. 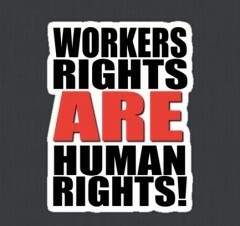 With human rights groups, professional organisations, one of the government’s own regulatory bodies, as well as even some Tory MPs all coming out against the Bill, a new survey published today shows the extent of public opposition to the legislation which, if passed, would represent the most profound attack on trade unions in generations. 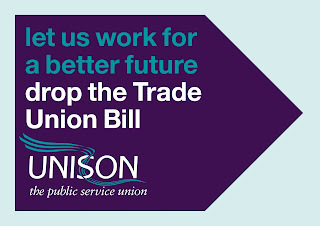 The poll, conducted by independent pollsters Survation on behalf of Unite, found that only 11 per cent of people ranked trade union legislation as a top ten issue that this government should be concerned with. Of the 20 issues that respondents thought their MPs should be concerned with, the NHS topped the list, with trade union legislation coming in dead last. The Bill seeks to severely curtail industrial action through ballot thresholds and other measures that would entangle unions in impossibly bureaucratic red tape, but the vast majority of the public fully supports the fundamental right to strike, with 84 per cent expressing support for workers’ right to withdraw their labour in a dispute. Unite general secretary Len McCluskey said that the poll was conclusive proof that the Bill had “no popular support”. Prime minister David Cameron has said that the imposition of strike thresholds was motivated by a desire to increase low turnouts, but so far he has rejected an easy and pragmatic solution proposed by Unite and other trade unions — secure workplace balloting. Currently, strike ballots are conducted by post — an obsolete method that has historically suppressed turnouts. The government has expressed concern that modern balloting methods such as electronic voting and workplace balloting are insecure and open to fraud or intimidation. What the government has failed to acknowledge is that workplace ballots are nothing new. In fact, they are currently in use under UK employment law. Secure workplace balloting is an accepted industrial practice as an option for union recognition ballots through the government’s own Central Arbitration Committee (CAC). A review of workplace ballots conducted so far shows that they significantly increase turnout — in workforces with more than 50 workers, 93.75 per cent of workplace ballots over union recognition had a return rate of more than 90 per cent, with no workplace having a turnout of less than 80 per cent. Contradicting the government’s contention that these ballots are open to fraud, the Electoral Reform Services, an organisation highly experienced in running industrial ballots, has confirmed that it is perfectly possible to run workplace ballots that are secret and secure against fraud or intimidation. The public too, overwhelmingly supports workplace balloting. In the Survation poll, of those expressing an opinion a full 71 per cent supported giving workers the ability to vote for industrial action at work. McCluskey highlighted this as evidence that “most people want to see industrial action ballots modernised by giving workers the right to vote securely at work”. “If the government was serious about boosting participation it would make sense to give people the right to vote securely at work on issues that affect their lives at work,” he said. On Sunday (November 8), leaders of some of the country’s biggest local authorities, representing the “northern powerhouse” wrote an open letter published in the Independent on Sunday calling on the government to back down on the trade union Bill. The letter was signed by leaders of combined authorities in the North-east, Greater Manchester, West Yorkshire, Liverpool City Region and Sheffield City Region. Devolved governments in Wales and Scotland, too, have vociferously opposed the Bill, with councils in Scotland suggesting they would not implement the Bill if it were passed into law. Welsh First Minister Carwyn Jones said in September, too, that provisions in the Bill incontrovertibly fell within the scope of devolved powers and pledged to oppose the legislation if it were passed. And during today’s report stage of the Bill, a Tory rebellion is brewing, with Tory MP for Stafford set to table an amendment which will reverse the proposed ban on “check-off”, a process that enables union subscriptions to be automatically deducted from public sector workers’ pay. Lefroy hit out against the government’s argument that check-off is outdated and a burden on taxpayers, calling this position “complete nonsense”. As UNITElive highlighted in August, unions always offer to pay administrative fees, which are in any case often negligibly small. Many private sector employers which use check-off often voluntarily agree to pay administrative costs themselves. Speaking on the BBC’s HARDtalk programme yesterday evening, McCluskey highlighted that the trade union Bill, if passed, would “create chaos” and again urged the government to consider the pragmatic solutions, through modernised workplace balloting, that he has proposed. But, he warned, no matter the outcome of today’s debate, McCluskey pledged that he “will support our members”. Stay tuned on UNITElive as the Bill goes through its final stage tonight. You can follow the debate live on Parliament TV here: http://www.parliamentlive.tv/Event/Index/2fed57d5-68f3-4867-bdfa-44f68ab93ee5 "
Arafel Comment: "Apart from attempting to co-opt the Liberals and undermine The House of Lords this Tory Party continue to gnaw away at the foundations of all Britain's human rights legislation and legal precedence from a position of extremely dubious mandate, they are however correct in the assumption that they are to a certain extent "untouchable" but only in the sense that Capone might have believed himself so, quote; "A series of talks about election fraud in the US, including the observation that unexpected swing results have been seen in the UK and Israel recently, prompting speculation that the practice is spreading from America (where it is fair to say that it is well documented with evidence). "More accurately "Algorithmic profiling of the demographics" (apologies), nm Posted by Gerard [User Info] on May 9, 2015, 10:15 am" ...which accounts for all the "Al-Gore-isms"! 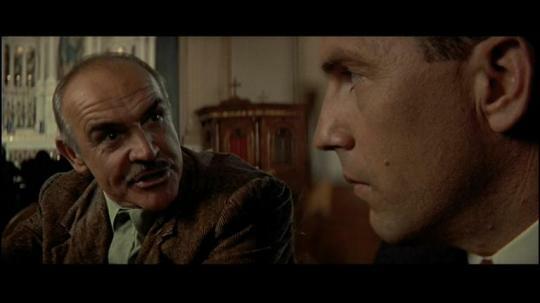 "Were the polls* bent Daddy?" ""U.K may be in death throws but what of "The Wider Europe"? Cameron has an hooooge domestic 'eadache but it's not his health I worry about with regard to Europe. We must now have a referendum on E.U membership, Britain seems to need another shakedown but the storm-troopers must be purged following Kristallnacht so expect a Night of the Long Knives over Europe**, but how and where? It will be those in the U.S administration with most influence over NATO and those with the most economic clout in the European market place (and the "all-seeing-eyes" -those who are both-), who will be experiencing the sleepless nights and worrying about who they are going to blame and how they are going to set them up for burning down The Reichstag." All posts to MediaLens message board. *I did say "Poles"...I'll put it down to a freudian slip ("all activities are just degenerate forms of bending" Bender Bending Rodriguez)! Will it really only be The Scottish Question that forces the British to consider the sticky subjects of insitutional and electoral reform?